Before I introduce you guys to the latest Terese Nielsen‘s alteration, let me just inform you that I’ve put on eBay part of my personal Pimp collection. There’s a total of 82 auctions that feature unique items in existance such as a playset of Foil Japanese Dark Confidant signed by Bob Maher. Please have a look at my eBay sales and good luck bidding! I’ve been seeing Johnny Depp’s face everywhere because of his latest movie “The Tourist”, and was reminded of what a great “look” he has, and how fun it would be to paint him. 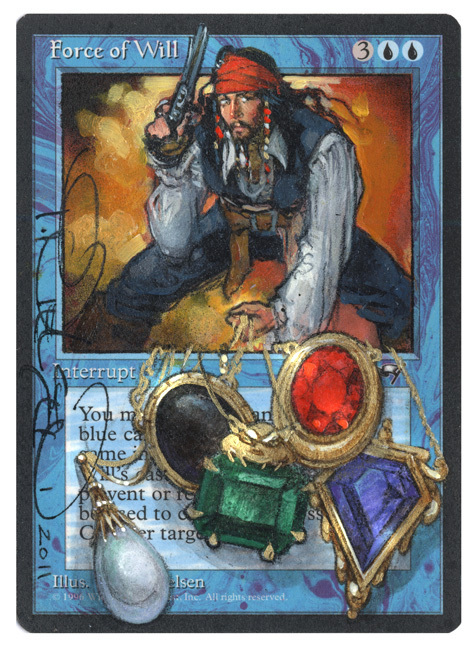 Captain Jack Sparrow was a character I enjoyed immensly, so here his is, featured here on a Force of Will. His spoils include the Mox Pearl, Mox Jet, Mox Emerald, Mox Ruby and Mox Sapphire. Click here to visit the eBay auction for Jack Sparrow’s Force of Will! Yet again, another amazing job by one of our favorite MtG artists of all times!